GatesAir, in partnership with Technische Universitaet Braunschweig's Institute for Communications Technology and TDF, has developed a new approach to deliver high-quality video mobile devices, leveraging advances in LTE and DVB-T2 technology. In this new approach, high demand content is delivered over a spectrally efficient one-to-many High Power High Tower (Broadcast) network and is received by devices which are LTE-A+ enabled and connected to the mobile network over which signaling is provided. Mobile network operators can leverage the broadcast network to offload high demand content from their networks while retaining control of customer content delivery. We have illustrated the process in live demonstrations (and in real-world field tests in both France and Italy) that use DVB-T2 as the carrier of the LTE-A+ downlink. 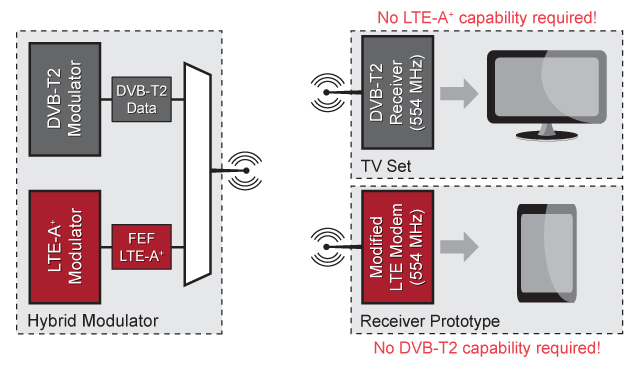 The LTE-A+ signals are embedded in Future Extension Frames (FEF) offered by the DVB-T2 standard. LTE-A+ is a working title used by Institute for Communications Technology for a possible next generation LTE solution. 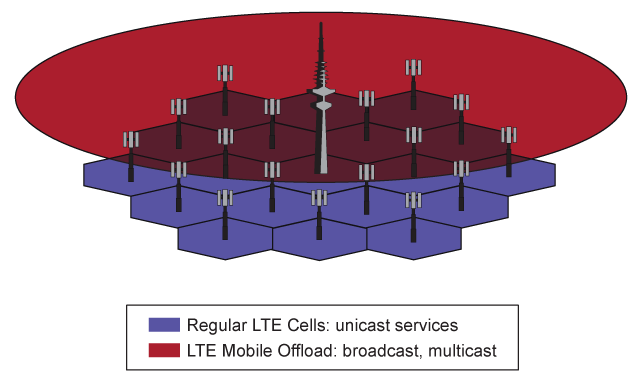 "LTE Mobile Offload" – Why? The number of Tablet PCs and Smartphones in use around the world is growing rapidly. Their displays support high quality video. All available market analyses suggest that the use of video on such devices will grow exponentially. Video will increasingly be watched live – specifically during large events such as the Olympic Games. In the past, systems such as DVB-H(andheld) tried to address this market. Outside of Asia none of them succeeded. 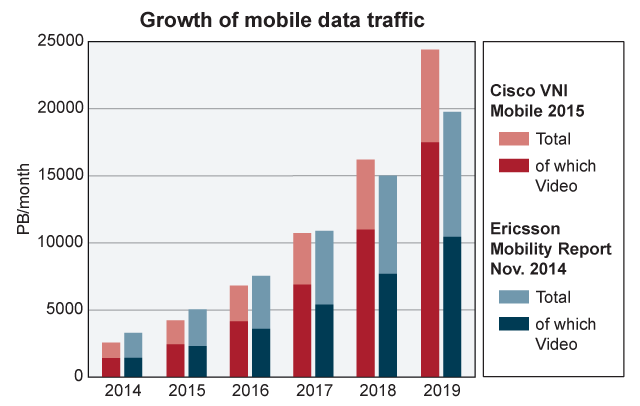 Cellular networks will not be able to cope with the growing demand for live video and it will not be efficient to distribute live video and audio @ 1.4 Mbit/s or more in thousands of network cells and possibly by several mobile network operators in parallel. High Power High Tower Networks exist already – they are used for terrestrial TV transmission. DVB-T2 is currently the most advanced terrestrial broadcast standard. It is in use in many countries of the world. In order to facilitate the migration from classical broadcasting to delivering high-quality video to LTE-A+ devices, we use DVB-T2 as the carrier. 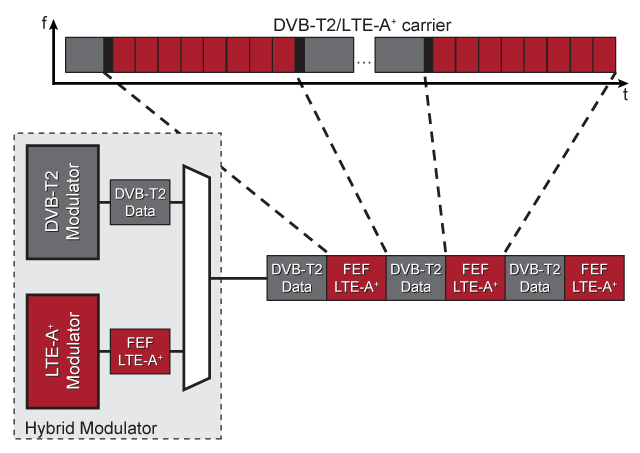 FEFs support the delivery of non-DVB-T2 signals inside the data stream, so LTE-A+ terminals don‘t require DVB-T2 tuners. Other carriers will be possible in the future – such as ATSC 3.0, or FOBTV, or a specific LTE-A+ solution. • A traditional TV set capable of receiving DVB-T2 presents the TV content. • A tablet PC shows the LTE-A+ video transmitted inside the FEFs. This demonstration is enabled by use of the powerful Software Defined Radio (SDR) framework developed by the Institute for Communications Technology.